Complex networks provide an alternative way to study extended climate data. The network measures can reveal complex and hidden spatio-temporal interrelationships. 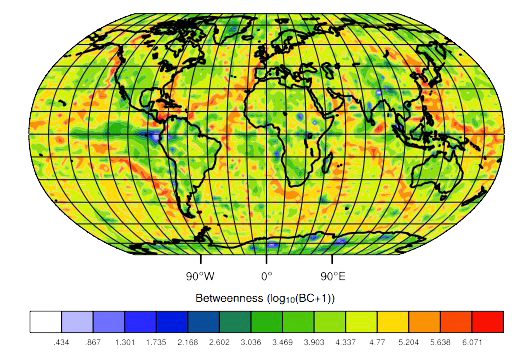 For example, the betweenness centrality of a climate network derived from surface air temperature exhibits distinct patterns coinciding with ocean currents. Donges, J. F., Zou, Y., Marwan, N., Kurths, J.: The backbone of the climate network, EPL, 87, 2009, 48007, doi:10.1209/0295-5075/87/48007.